No matter where you live, outdoor entertaining at your home increases in importance as the weather warms. Adding a patio or balcony to your home can allow a quick escape from the daily cares of life and also is a way to truly enjoy your outdoor landscaping and available sunshine! Besides being a great way to increase the usable space of your home, the addition of pavers, walkways, or textiles and out of doors furniture can really enhance your home satisfaction. But the years of cutting photos from magazines, evaluating work samples, and “trying” to convey your ideas to a contractor are waning quickly. Traditional methods are evolving as more consumers seek home improvement ideas online and even on their phones! According to Houzz, a top online resource for home remodeling, 40 percent of their users are utilizing mobile devices to remodel their homes! As you consider home additions, improvements, and landscaping for your home, where do you turn and what do you use for research? 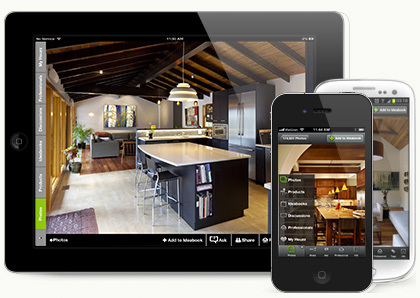 Houzz reports that 65 percent of their mobile audience uses iPads and 18 percent are Android users. The ability to show images, color palettes, materials and finishes directly with contractors and designers brings home remodeling to a new level. Of course, consulting with your favorite realtors to discover recent trends and the improvements that will contribute the most to your home value is always helpful, too. Call me to discuss your home and what you can and “should” do to improve it and your outdoor landscaping.